n.b., this review was written January 22, 2011 – before the Academy Awards nominations were announced. A post-nomination update from January 27, 2011 is given at the end of this post. The Town was a pleasant surprise. Expecting yet another bleak, joyless, flat-story entry in the cadre of movies from 2010, The Town turned out to be none of the above. Finally a movie that hits on many levels: story, plot development, character arcs, protagonists, antagonists, with very strong ensemble performances. It’s not a perfect movie, but it is very, very good, and among the best of 2010. The Charlestown neighborhood of Boston is renowned for churning out a high number of armed robbers, generation after generation. These robbers never leave their Charlestown life on their own volition, the neighborhood where there is an unwritten code to protect that lifestyle. Such robbers include friends Doug MacRay, James Coughlin, Albert ‘Gloansy’ Magloan and Desmond Elden. Doug and James in particular treat each other like family, as the Coughlins have realistically been as such to Doug since Doug’s mother ran off and Doug’s father, Stephen MacRay, was sent to prison. James’ single mother sister, the drugged out Krista Coughlin, and Doug have a casual sexual relationship. The foursome carry out a mostly successful bank robbery, but due to circumstances take the bank manager, Claire Keesey, hostage for a short period before releasing her physically unharmed. They find out that Claire lives in Charlestown, so they want to ensure that she did not see anything that could incriminate them if they were to ever run into her. As such, Doug begins a personal relationship with her to find out what she knows and what she’s told the police and the FBI, who have taken charge of the investigation. He learns that she has kept some information from the authorities for her own protection but information that could identify James in particular. But Doug slowly falls for her, as she does for him. Ultimately, Doug dreams about leaving his Charlestown life to be with Claire anywhere but there. But Doug has to try and keep his true identity from her, and keep the fact that he is seeing her from his colleagues. But leaving is not as easy as he would like as he and the gang are tasked with a big job by a local gangster named Fergie whether Doug likes it or not. And Adam Frawley, the FBI’s lead investigator, comes into evidence that links the foursome to the bank robbery and a subsequent armored car heist, so is on their tail for evidence that will send them away dead or alive. Ben Affleck directs (in only his third film behind the lens) and stars in the movie. He excels both in both roles. In his performance, Affleck finds his roots and plays to his strength as a heart-of-gold Boston gangster, Doug MacRay, looking for a better life. It’s been awhile since I’ve seen Honest Ben be so comfortable in a role, and he instills a profound sense of longing and hope. We find ourselved pulling for him from the outset. Affleck assembled a wonderful cast, with honest, committed, selfless performances from all. Of note are Jon Hamm, in a surprisingly gritty portrayal of an FBI agent on a mission, Rebecca Hall as a sympathetic and sweet love interest for Affleck, and Jeremy Renner, fresh off an Academy Awards Best Actor nod for his performance in “The Hurt Locker”, as the edgy, unstable best friend, unintentional obstacle, and foil for our protagonist finding his escape – Renner is an actor to watch, and I think his best work is still to come. Special recognition needs to go to Chris Cooper, in a small but powerful role as Stephen MacRay, Doug’s father who is serving time in prison. With limited screen-time, he nevertheless captivates while there. And then there is Pete. Timeless, selfless, immortal – yet mortal – Pete Postlethwaite, the actor Steven Spielberg famously called “”the best actor in the world” after working with him on The Lost World: Jurassic Park. Pete died 2 January 2011, and The Town was his second-to-last performance. Understated, captivating, raw, real – an everyman even in extraordinary circumstances. Good night, Pete. Be proud of all of your work. Your performance in The Town sits with honor among the many, many gems in your career. The movie works on all levels. Lovingly shot, crisp dialog, outstanding performances, a complex, surprising and unpredictable script. I loved the twists and turns in the story, the multiple layers to each character, and the complex voyage from curtain to curtain. The Town has it all. It’s only a small iota away from a tour-de-force, and yet it has its flaws. Somehow, the movie strayed a small bit over the line, from a classic to a bit … too much. Each character, while compelling, was also just a little but too much to be believable. The story was just a smidgen too fantastic. The dialog was a hair beyond authentic. Each performance was just a bit too incredible. Authenticity was stretched just a hair too far. Bottom-line: a very good movie from 2010. Kudos for the acting, directing and story. In the era of 10 Best Picture nominees, this film deserves to be nominated. Similarly nods for best actor (Affleck), director (Affleck), supporting actor (Renner), and adapted screenplay would not be undeserved. 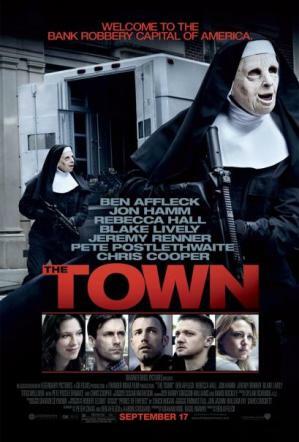 I’m disappointed that The Town didn’t fare as well as I’d hoped in the Academy Awards nominations. Renner certainly deserved his supporting actor nod – bravo. However, this film remains a favorite of mine in 2010, and I think it deserves more. I’m not saying that it is the Best Picture, nor that Director and Adapted Screenplay wins are deserved – however nominations most definitely are.